We’re all familiar with what thermal carafes are. We all know that they are all insulated to one degree or another – some are double walled while others are glass lined and vacuum insulated for even better heat retention. However, although people are aware about that some carafes are better insulated than others there’s one problem, distinguishing between all of the options is really hard – they all start looking the same. The absolute best carafe in my opinion is this Zojirushi glass lined carafe, but it looks very similar to this slightly more expensive and poorly reviewed alternative! That’s why we are here and that’s why we do what we do – we want to help you find the perfect carafe and we don’t want you to waste your money! In today’s article, we are going to list out and review the best coffee carafes for keeping your coffee piping hot all day long. Each of these carafes are excellent and they each would make a great choice… and they will all keep coffee hot for a long time. So now, lets look at them one by one! Now, once again, the competition is fierce in this space. There are several companies that have taken special care towards insulation, so that people who are in need of it would buy their products- just another kind of business strategy. Among the models that are particularly well made we have opted to hone the list of best coffee carafes done by both form and function. In the list that follows you’ll see a number of beautiful carafes that all perform well. Many are vacuum insulated, others use a glass lined interior to keep them easy to clean and to limit flavor changes. Another thing is most of these units come in various sizes both big and small. So, lets get to it! One of the most famous products comes from Emsa Eleganza. 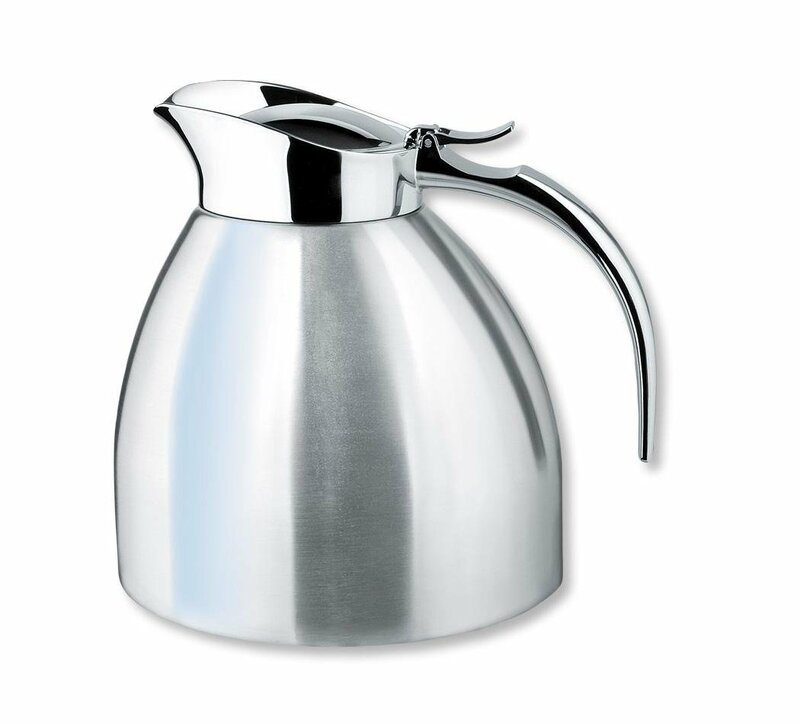 The Emza Eleganza Stainless Steel Insulated Carafe is one of those models that people go to first. However, this doesn’t mean that we don’t have to take a look at the main features of this model. This model, to begin with, is a stainless steel model. 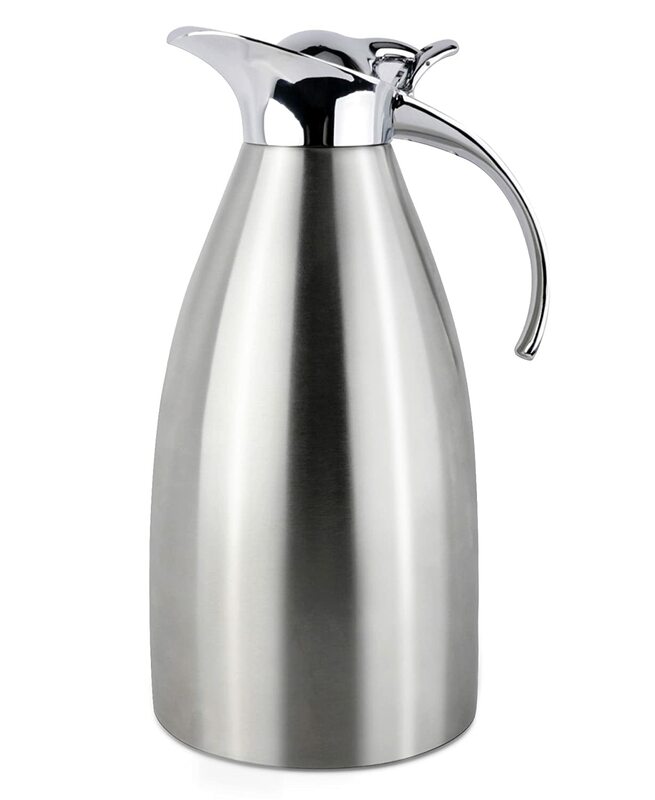 It has a capacity of about 44 ounces and it’s really well insulated, making it a great option to use if you want the temperature to stay consistent as you drink. This is, once again, one of the go-to models for a lot of people and I believe that’s a well deserved repuation. 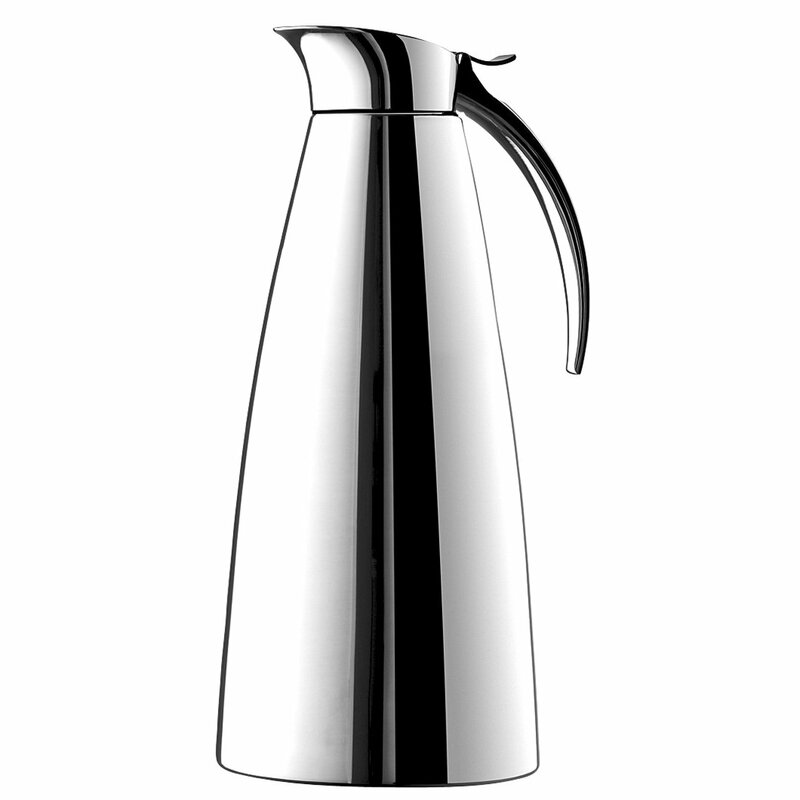 Panseor Thermal Coffee Carafe is one of the names that follows close to the Emsa. This is yet another model that’s really effective. Have you ever noticed the fact that the 2nd best is often better than the first one but is underrated? Well, same here- let me explain why. This model is almost the same as the last one, except when it comes to a few things. First, this model has a vacuum insulation, which is by far one of the best insulation methods. This model also provides you with a comparatively larger capacity, with a capacity of about 68 ounces- substantially larger than the last one. This makes it a great choice if you want a fairly large model. 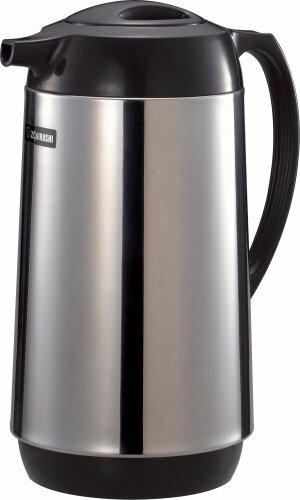 The Zojirushi Polished Stainless Steel Vacuum Insulated model is just as functional as it is attractive. It’s one of the models that have all the great properties, making it a well recommended model. To begin with, this model has a polished stainless steel body, granting it points for both aesthetics and durability. On the other hand, this model also boasts vacuum insulation, which puts it far ahead of a lot of other competing models in terms of functionality. Vacuum insulation is one of the best kinds available out there and quite a lot of people won’t go without it. That’s not all, this model is specially designed to prevent loss of heat as much as possible. So, when it comes to insulation options, this model is by far one of the best you have available, out there. And even more, this model is also said to be one of the most economical, making it great for those who need better insulation on a budget. Let us now discuss another model that looks really similar to the last one. This is the Tiger Thermal Insulated Beverage Carafe. This model is treated as one of the best models that do not have vacuum insulation. Yes, some models with vacuum insulation are naturally better, but those models are usually more expensive in comparison. 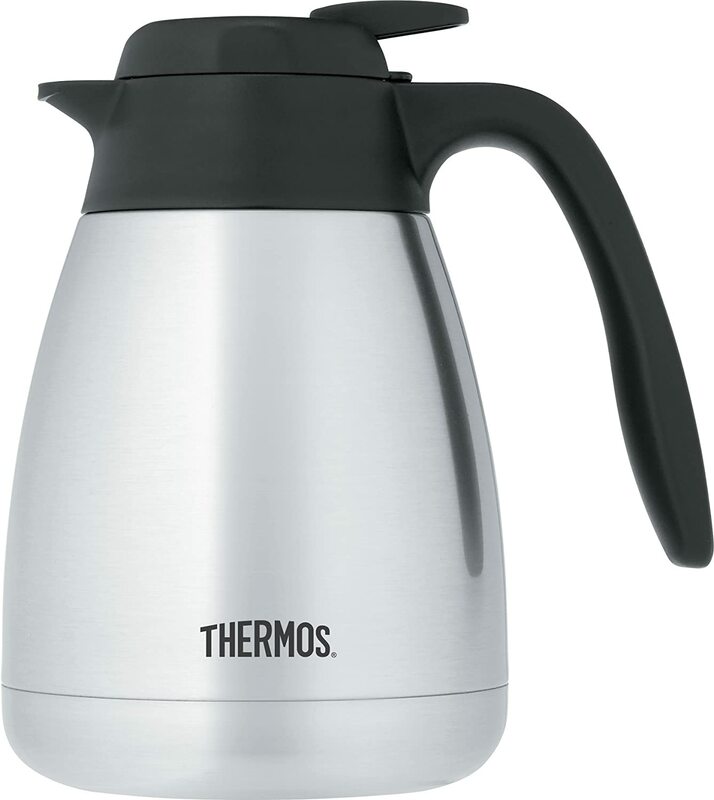 This model takes care of both the financial and functional aspects at the same time, making it a favorite for a lot of people, especially for some who are on a comparatively conservative budget and don’t want to spend too much on a carafe. Thermos. Now that’s one line of products you’re bound to be aware of. In fact, it’s one that fills our minds with a sense of security about the quality of the product. Every other product might go wrong, but Thermos? Never, right? That’s how much we believe in this product. Thermos, as proven by a couple of surveys, is one of the most trusted and loved companies out there. That, in itself, is enough reason to buy this product. However, even besides that, there are a lot of things that makes this product great. 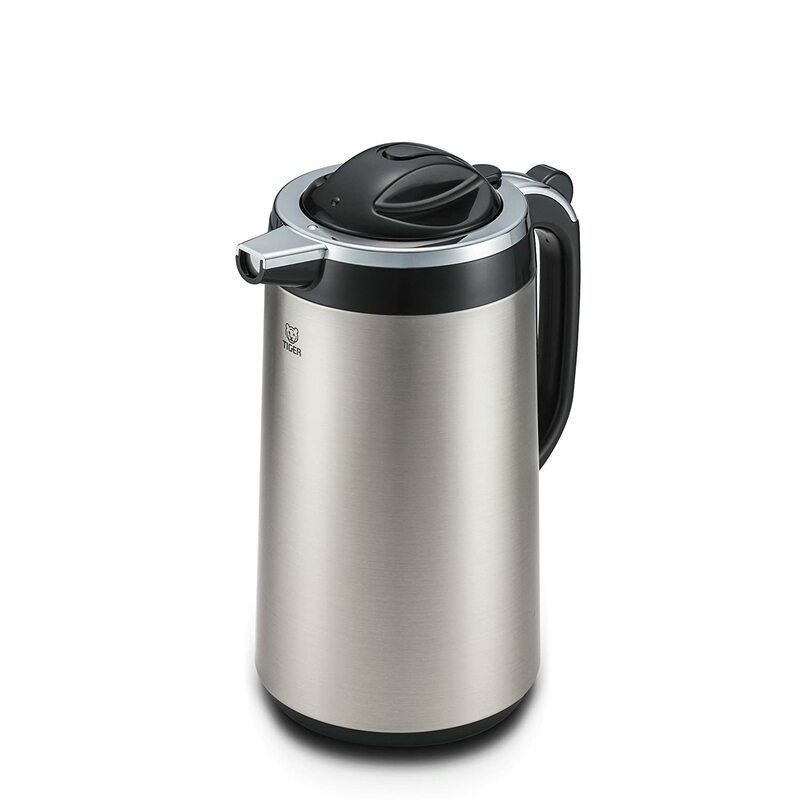 This product, too, has everything that you might ask for of a great product, ranging from a stainless steel body, to vacuum insulation, and a sensible capacity of 34 ounces, just about right for a standard serving for a group or family. This model, on the other hand, is one of the most attractive. This model from Isosteel just steals the spotlight because of it’s beautiful and unique look. After that, it remains in the spotlight with its outspoken list of great features. This model provides you with a stainless steel body and double walled vacuum insulation (which is one of the very best you can get out there). This model is also dishwasher safe. First of all, the capacity of the model has been kept in mind. This is one of the properties which must always be kept in mind because it directly depends on what you’re looking for. As in, if you’re looking for a 2-liter model, neither a 1-liter model, nor a 10-liter model would be a really great choice for you. So, this is one of the factors that have received special consideration and attention. Next, aesthetics has also received consideration because that’s important to a lot of people. You don’t want to ruin the look of your whole kitchen because of something you didn’t properly consider, right? So we’ve done the hard work for you and chosen the models that would fit your kitchen beautifully. And, of course, reviews from direct customers are a direct source of knowledge about the product without the hype. If they liked it, then that’s the greatest evidence that it’s a good product from a general perspective. That has also been taken note of to ensure that you get the best product. All these points have been considered while making this list. This has been done so that you can get the best model. However, it must still be kept in mind that there are some needs that specifically depend on you. It’s important that you know about them and judge the model accordingly. That’s the only way to find the best model for yourself. Let us now move onward to taking a look at some of the commonly asked questions. As I just said, a few questions might arise in your mind at this point. While we can’t exactly know all of them, some of them are so common that we feel like answering them would be indispensable. So, here are the answers to the frequently ask questions at this point. Should you, however, have any other questions in your mind, feel free to reach out to us. We promise that we will try our best to help you in any way possible. After all, we coffee lovers must stick together, right? So please feel free to reach out to us for any query that you might have. Is insulation really that important? Yes, depending on your specific needs, it might be that important. While some people don’t really seem to mind it much and it’s really one of the most underrated factors, as I said, it’s actually something that a lot of things depend on. The main thing, obviously, being how long your coffee will remain warm. Most coffee drinkers hate it when their good coffee gets cold and dull. Except the capacity/size, not really. The whole mechanism is the same, it’s only the size that’s different to suit some specific quantity needs. Beyond that, size shouldn’t matter, except in how it affects how often you need to brew. How important is vacuum insulation? Vacuum insulation is the highest level of insulation out there. So, it’s one of those things that you might not find with every model, however, it’s like an entirely different level of complete insulation which helps you hold the temperature for a far longer duration. These are likely the best models that are available out there. We have already mentioned the main things that we have judged them on. However, that doesn’t mean that these are the only ones out there. You can always search for more models, on your own. You must keep in mind that the best model out there isn’t necessarily the best one for you. The best model for you is the one that serves all your needs at the most affordable price. So, keep this fact as well as your specific needs in mind when you go out in the market to find the model that is the best for you. 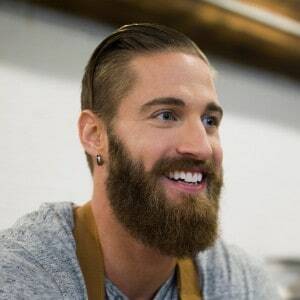 This is the only way to find the right model for yourself, as all the ones anyone else may suggest have a certain degree of generalization attached, since only you can perfectly know your specific needs. Gamble Bay Coffee is always here for you. We’re here to help you find the best model for yourself by providing you with the right information that you need to do that. Feel free to reach out to us, should you have any queries and do not forget that we are always here and that we are here ONLY for you.